While i am sure i will still wear a lot of navy during this spring, and that khaki (which i recently become quite addicted, after a Calvin Klein blazer, 2 Boss tops and 1 pair of Bally sandals purchases) will be a preferred color. 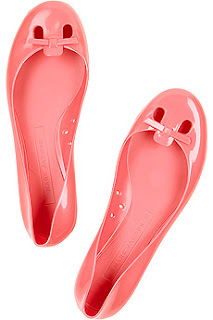 But while browsing through the spring collections that are already online, i could not love the gorgeous coral shade, used to create such gorgeous shoes by my 2 favorite brands: Marc Jacobs and Miu Miu. 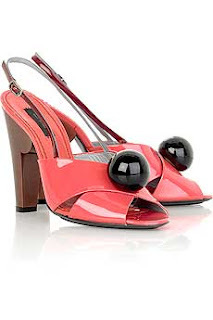 The Marc Jacobs Mouse shoes are sure a signature style of the designer. And in coral jelly are simply irresistible. A must have for next summer Holiday, perfect with a beach dress or a simple pair of jeans. 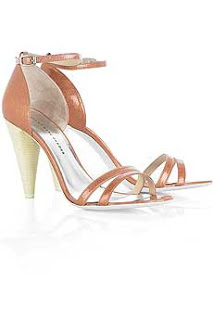 Glitter strappy sandals from Marc by Marc Jacobs are great for a fun approach of day time wear. Perfect to be paired with some dark/neutral clothes. Vivid Miu Miu sandals. I definitely would match them with some yellow pale clothes. I saved for last my favorites: the Marc Jacobs sandals are breath taking. With a vintage feeling and shiny leather, they are just perfect for my way of dressing. What to do: order them now, or wait for the sales? Tough question indeed.